Who knows how the Nintendo Switch version of Mario Kart will turn out, but it will be hard to part with Mario Kart Wii. Though now nearly a decade old, and already upgraded to Mario Kart 8 on Wii U, the Wii version of Mario Kart feels like my version – for me, it was the first time that all Nintendo’s kart racing elements combined flawlessly. Mario Kart Wii takes the best from its own karting legacy, and jettisons the parts that didn’t work. 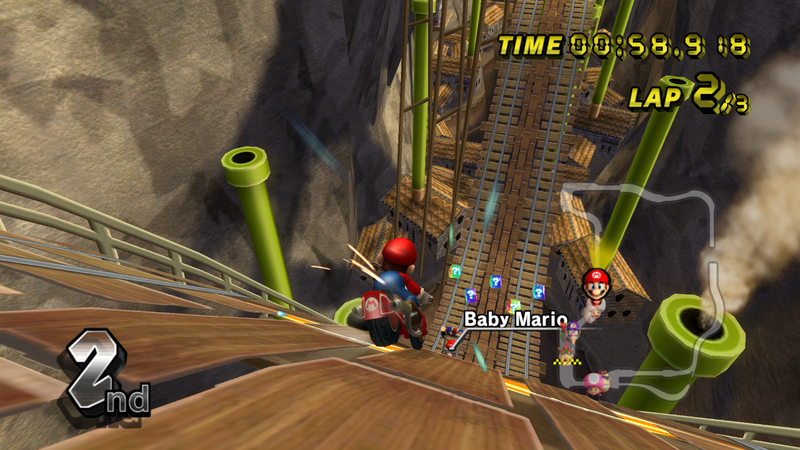 Gone was the awkward two-to-a-kart schtick of the GameCube’s Double Dash!! And back in was the “bunny hop” – which serves little gameplay purpose, since drifting works much as it always did, but that little hop before steering into a power slide just feels right! 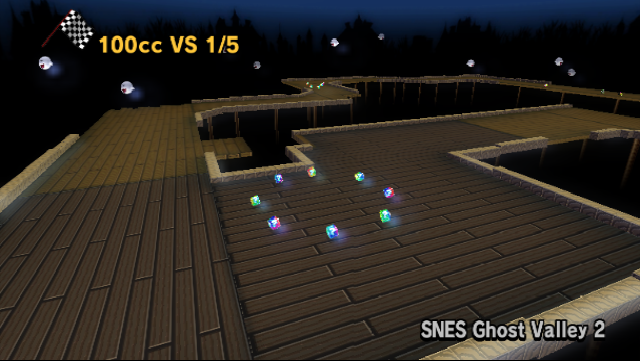 Gone also was the slack track design from the N64’s Mario Kart 64, with its lengthy courses and often little player interaction. Don’t get me wrong. I love the earlier games. We must have clocked more multiplayer hours on GameCube and N64 Mario Kart than any other game from those eras, possibly more than Super Smash Bros. or even GoldenEye. GoldenEye! But for me, Mario Kart Wii took the gameplay mechanics from the earlier titles and tuned them, smoothing out issues and building a purring, practically perfect arcade racer. The Wii version did have new tricks up its sleeve – with the motion controls, a shake of the controller when airborne will give you a speed boost. Bikes – with their tighter cornering and speed advantage – were the other new addition. At its core, Mario Kart Wii distilled go-kart racing into an addictive art form. And it’s the wide range of options that make the game. More than any other game in the series, I appreciate the large variety of tracks in Mario Kart Wii. The 16 new circuits veer on the right side of gimmicky – highlights include avoiding a herd of cows in Moo Moo Meadows (with its twangy, folksy music); clinging onto branches on Maple Treeway and dodging giant Wigglers; and barreling up and down the side of the snowy DK Summit. Mario Kart Wii also features a well-chosen spread of retro races. The 16 bonus courses included are pretty representative of years past – the old SNES tracks are all hairpin bends and 90-degree angles, relying more on drifting skill and precise cornering. Solid retro choices include the N64’s Sherbet Land (cute penguins! ), DS Desert Hills (cute Pokeys! ), and the GameCube’s Peach Beach (cute weird duck creatures!). Don’t be fooled by the charming exterior – the Mario Kart series has built itself on ultra-competitiveness. The four-player versus mode is a candy-coated crucible in which many friendships and relationships have been burned to husks. Though there are no longer any online multiplayer options – Nintendo turned off support for its Wi-Fi Connection back in 2014 – local multiplayer (what we knew as “split-screen” growing up!) is the way that Mario Kart is meant to be played. 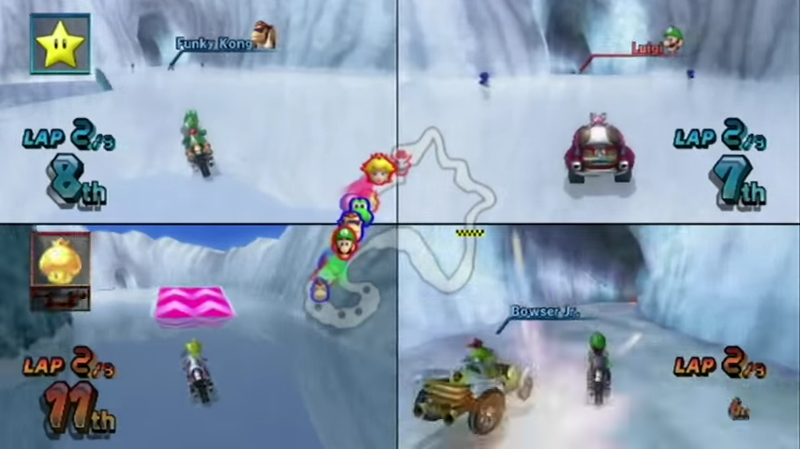 Mario Kart Wii was the first time that race and battle options felt fully customizable to me. In this version, you can play with all sorts of settings – CPU drivers can be added to make up the numbers, or removed if you want to concentrate on racing only your friends; CPU difficulty level can be changed; items can be set to aggressive or defensive, or removed entirely. And if you want to take the competitive edge off (or ramp it up), a much appreciated addition is the team race mode, with player points aggregated to red and blue sides. There’s an expansive range of karts and bikes, each with their own attributes for handling, drifting, acceleration, and top speed. Combined with a large cast of Nintendo characters, from lightweight Toad, to good all-rounder Mario, to the bruising Bowser, and you have as comprehensive a Mario Kart as there has ever been. Though never my favorite – I felt that it distracted from the racing – even Balloon Battle has grown on me over the years, especially with the computer-controlled drivers removed so as to maximize the mayhem amongst friends. Though, as with previous versions, the arenas are unwieldy – it takes a frustratingly long time to track down your opponents. With Nintendo’s Wii philosophy of opening up gaming to all, the controls for Mario Kart Wii are easy to learn. 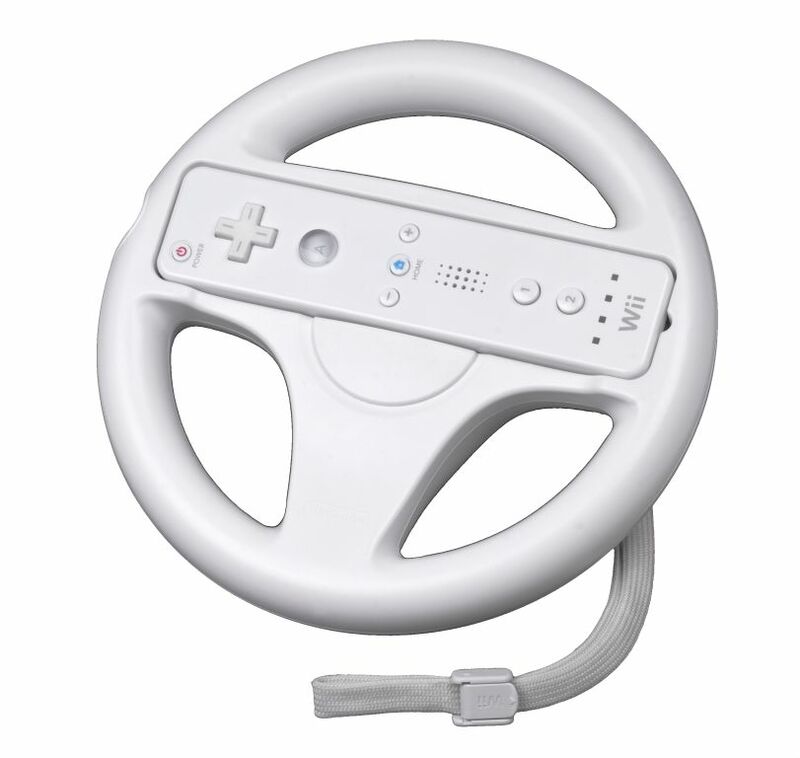 Let’s pay tribute also to the bundled add-on, the Wii Wheel – a steering wheel peripheral that the Wii Controller slots into, providing new gamers with an instinctive way to play using the balanced motion controls. In keeping with the game’s range of choices, you can also use the controller without the wheel; or use a controller-and-nunchuck combination; or even plug in a GameCube controller if you want to play old school. The Wii graphics may not be that far advanced from the GameCube era, but photorealism is hardly the point here. As you’d expect from another kart adventure in the Mushroom Kingdom, Nintendo keeps things cheery and sunny. Even the evil Thwomps in Bowser’s Castle come across as cute rather than menacing. The music provides a complement to the racing without overpowering the action. 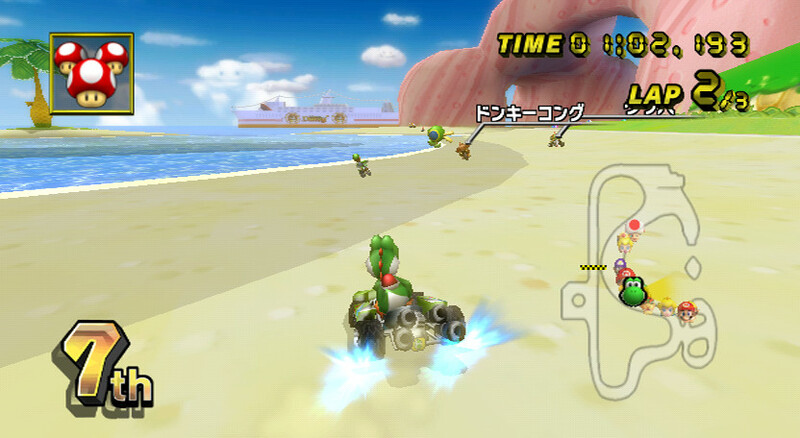 In keeping with the bright and breezy tone, the music for the Peach Beach and Daisy Circuit courses create a classic Super Mario atmosphere of being on a cruise to a somewhat trippy tropical island. Is Mario Kart Wii the definitive version? I feel as though the original has to be definitive, as is the case with the first of many series. But Mario Kart Wii defined the Nintendo Wii, and the innovative use of motion controls, alongside Wii Sports. If not exactly definitive, Mario Kart Wii has to be one of the most all-inclusive video games ever made. Nintendo’s trademark accessible gameplay offers something for kart veterans and newcomers alike. After nine years, Mario Kart Wii remains the go-to multiplayer pick, and is a firm favorite for Wii gamers (especially those of us who never made the jump to the Wii U). In terms of sheer longevity, Mario Kart Wii remains at the top of the podium. I loved it, although Mario Kart 8 is the masterpiece for me. 2+ years on and I’m not bored of it in the slightest – the online races are incredible. I think they’re adapting that for the Switch. I’ve only played a little bit of Mario Kart 8, but the controls using the tablet were much better than I expected. Plus I understand you can play as Tanooki Mario?! That is indeed correct! I loved the Wii version but Mario Kart 8… cripes! I just love that game. 10/10. Perfect. Wondrous! I think Mario Kart 8 bested it, but I love Mario Kart Wii. The motion controls are a blast. I just wish motorcycles and karts were more balanced; the latter are clearly superior. Only played it a few times with my niece, but I really struggled using the motion control to steer. A combination of not being anchored to anything, like more traditional steering devices, and being too used to playing with normal gamepads. I guess you get used to it eventually! Some nice tracks though. But I won’t hear a bad word about Double Dash, I have fond memories of playing that well into early hours of the morning with my houses mates when I was a student. Four-player split screen for the win! Though I do like the motion controls for Wii, I did end up splitting the difference by using the remote-and-nunchuk combo. And I did like Double Dash as well! I thought the course design overall in that one was great. As others have said, I think that 8 overtook Wii. The former just feels so solid. That said, Wii was hella fun. I poured so many hours into perfecting my times so that I could show off to my friends. And it was nice to have a game that so many people wanted in on! Even my parents had a go. Mario Kart Wii was one of my first online games and, although I prefer local multiplayer, it still holds a place in my heart for that. Karting with your school friends is one thing, but karting for the first time with that friend you have who lives halfway across the world? That is a magical experience. I only ever played Mario Kart 8 on a friend’s console, so I definitely feel more comfortable on the Wii version. I’ve spent many fun evenings racing against friends (and against the game’s AI). It’s really a solid game and I’ve never met someone who didn’t get into it once they started playing! It’s so true – I think the controls make Mario Kart Wii accessible to new gamers, as well as veterans. Ya know, Mario Kart Wii was the only Mario Kart installment I never played, and I just realized reading this post. I just obtained a copy of it recently and have been having the issue of low quality on an HD tv, so trying to figure out a workaround temporarily.